Even in a life of wine tasting, some assignments are tough. Tasting hundreds of young wines with their tooth-staining, enamel-eroding, indigestion-inducing acidity and tannin can be a challenge. But this tasting was a little bit different… As a confirmed chocoholic, I was intrigued to see that UK wine accessories specialist The Wine Gift Centre has just become the UK importer for Brix Chocolates for Wine, a range of highest quality chocolate bars specifically created to match with wines. The Smooth Dark Chocolate Brix is said to pair with Champagne, Riesling, Pinot Noir and Vintage Port for example, whilst the Extra Dark Chocolate is said to pair with Bordeaux, Cabernet, Zinfandel and Syrah. All of the chocolates are high in cocoa content at between 40% and 70% cocoa, and are the brainchild of Dr. Nick Proia, an Ohio pulmonologist. Dr Proia developed Brix when he could find no chocolate on the market that really paired well with wine. 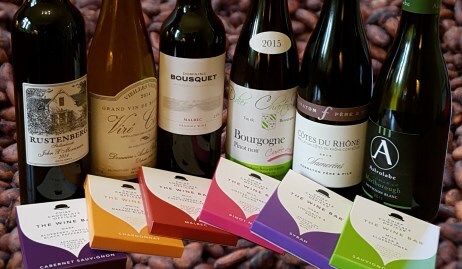 After “a good deal of trial and error,” Dr. Proia crafted the bars from a single origin Ghanaian chocolate known for its red fruit tones, mixed with the highest quality confectionary chocolate, each pitched to match certain wine styles. So I assembled a selection of the Brix bars and a selection of wines of the appropriate styles for a tasting. Brix comes either in delightfully chunky ‘bricks’ of solid chocolate weighing 227g and costing £7.99, or in ‘bite size’ individually wrapped pieces, a box of 24 assorted flavours costing £8.00. The big bars are designed to be shattered with a knife, and consumed shard by shard with wine. The chocolate quality on its own is extremely high, and the fruitiness of the Ghanaian cocoa really comes through powerfully in each flavour. The ‘Smooth Dark’ chocolate with 54% cocoa was probably my favourite when tasted on its own, but the real test came when the wine matching exercise began. This Pinot Noir dominated blend pours a delicate pale copper colour. The nose is really quite rich, with cream and bready notes and a honeyed character to nice bruised apple and pear fruit. The palate has a nice sense of easy-drinking sweetness and some breadth, making this very approachable, with good acidity and a fine, crisp mousse giving some elegance too. 90/100. £26.99, Laithwaites. See all stockists on wine-searcher.com. With Smooth Dark Brix: trying this alongside the suggested chocolate proved to be really quite a dedcadent combination, as the inherent ripeness and hint of sweetness in the wine melded into the fruity and smooth body of the chocolate as it melted in the mouth. The wine did start to feel just a touch more herby and vegetal as the chocolate coated the mouth, but the overall effect was really most enjoyable. I also tried Milk Chocolate which was pleasingly neutral, whilst Extra Dark provided a very nice, firm counterpoint to the wine’s bubbles. At five years of age this has taken on a little colour, and a lovely hint of mineral, paraffin-wax development beneath pristine apple fruit. It’s an un-showy style aromatically, and that discreet character continues on the palate: make no mistake, this has delicious concentration and a grip of grapefruit flavour and acidity, but it has restraint too. The mid-palate allows the waxy, full texture to coat the mouth, whilst those ripe but razor sharp apple and citrus flavours betray only the most tantalising glimpse of tangerine and lime, and more opulent character. A bracing, firm finish makes this a fairly intellectual and yet delicious, bone-dry style. 92/100. Around £19.00, Slurp, L’Art du Vin. See all stockists on wine-searcher.com. With Smooth Dark Brix: this worked surprisingly well with the suggested Brix, though it was not my favourite combination of the tasting. The richness of the chocolate seemed to leave the lemony acidity hanging out on its own a little more (when tasted on its own a tangerine and lime exoticism came through more) but on the finish it became rich and creamy, both chocolate and wine finishing with similar length and intensity. The wine was too lean for the Milk Chocolate Brix, but rather nice with the Extra Dark: lots of bite and body in the mouth. From the Yarra Valley, this wine has a pale to medium salmon pink colour and quite a powerfully vinous nose, with a bit of yeasty character, some subtle oak and plenty of earthy and authentically briary Pinot fruit. On the palate it is dry, with an orangey tang to the fruit and some cranberry, a hint of vanilla and rich texture making this a particularly textural and mouth-filling rosé, though there’s no mistaking the crisp freshness of the finish. An unusual and successful style. 89/100. £13.99, Planet of the Grapes, Philglas & Swiggot, Theatre of Wine. 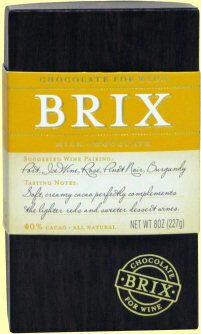 With Milk Chocolate Brix: Milk Chocolate is suggested for both Pinot Noir and Rosé. I thought it worked really well, the sweeter, milkier quality of the chocolate easy to taste through even this quite assertive rosé, but along with the hint of vanilla in the wine it was creamy and satisfying, not clashing with the wine’s acidity. I tried this wine with the Smooth Dark, also suggested for Pinot Noir, and it was less successful: the powerful richness and more enveloping nature of the chocolate just a little too much for even this powerful rosé. Made for The Wine Society by Henri Prudhon, this red St-Aubin is 100% Pinot Noir and balances a fine woodlandy, briary Pinot character with leafy raspberry fruit and just a hint of a strawberry softness and richness. On the palate the texture is nicely silky, and this has a clarity that reminds me a little of a good Cru Beaujolais, with plenty of fruit and medium body, but filled with elegant flavour. 89/100. £9.95, The Wine Society. With Smooth Dark Brix: this worked brilliantly, the luxurious depth of the chocolate adding body and richness to the wine, emphasising its silkier qualities and bolstering the depth of the fruit. A nuttiness and certain berry fruitiness of the chocolate seemed to be emphasised too in delicious style. The Milk Chocolate (40% cocoa) is also recommended for Pinot, but I felt the Smooth Dark was a far rounder and more satisfying match. With Medium Dark Brix: in fact with this slightly leaner, spicier style of Merlot the chocolate worked really well, adding some beneficial creaminess and richness on the mid-palate and lending the wine a sense of more flesh and more sweet-fruited weight, the berry flavour and texture of the chocolate filling in perfectly. With the Smooth Dark it worked well too, but the extra creaminess of the Medium Dark makes it first choice. A serious, range-topping Shiraz from the coastal region of Cederberg, this wine is aged in mostly French oak from Nevers and Alliers, around 70% of which is new. It is an immediately powerful and concentrated wine suffused with smoke and rich black fruit, but there’s a little cooler, herby and green olive note too that gives lovely earthy authenticity and a savoury appeal. On the palate it is concentrated and muscular, the rich, ripe fruit layered with pepper and meaty, spicy notes, with plenty of chicory-like tannin and acidity adding more tension and drama. Terrific. 92/100. £18.50, Bancroft Wines (£16.56 by the case). With Medium Dark Brix: This was a delicious match with this wine. The chocolate itself has a lovely bitterness, and with the wine that kirsch-like, bittersweet cherry skin flavour was emphasised, whilst the creaminess of the chocolate left the meaty, spicy finish of the wine even darker and more dramatic. The chocolate did not swamp the wine’s flavour and didn’t smooth out the meaty grip too much either. The Smooth Dark worked well, but the extra cocoa bitterness of the Medium Dark was a winner. An interesting Bordeaux blend, dominated by Cabernet Sauvignon but with all five Bordeaux red varieties plus a touch of Petite Sirah and Shiraz. Aromas of rich and very ripe berry and stewed plum fruits leap from the glass, a certain note of over-ripness but creamy and vanilla-licked too. Very New World in style with an abundance of come-hither charm. The palate delivers more of the same, the fruit really sweet, the spices bold and the oak perhaps slightly overdone – certainly not quite integrating on the finish and adding a smoky element. Robust, big-hearted and lip-smacking stuff, lovers of the style will love this. 89/100. Not currently in the UK. With Extra Dark Brix: Intended for Cabernet and Bordeaux, the chocolate has great snap and the least pronounced fruitiness of the four examples. With this ripe and rich blend the combination was interesting: the Panamera is a low acid style and the bite of the chocolate seemed to add a little astringency in the finish, and yet the ripe berry fruit was lovely with the almost liquoricy dark flavour of the chocolate. I liked this wine with Medium Dark Brix too, the extra sweetness and lower acid of the chocolate emphasising its creamy quality. A blend of typical Port varieties Touriga Nacional, Touriga Francesa, Tinta Barroca and Tinta Roriz, this has a very youthful nose showing a bit of spirit and bold, juicy red fruits as well as small notes of tobacco and smokiness. On the palate it has medium sweetness, the ripe red berry fruit filling the mouth, with nutmeg spice, a hint of chocolate and some spirity heat warming the throat in the finish. Decent length, and a nicely done LBV Port with a bit of finesse. 89/100. £12.99, Tesco, Morrisons, Asda, Waitrose, Co-op. With Smooth Dark Brix: Smooth Dark is recommended for Vintage Port, whilst the Milk Chocolate is recommended for ‘Port’. The former worked exceptionally well with this wine, the sweetness and bitterness of both equally weighted and combining to present a sumptuous mouthful, yet with a clean, long finish, the creamy, smooth darkness of the chocolate lovely against the sweetness of the wine. The Milk Chocolate Brix worked very well too, the Port gaining the upper hand and asserting through the mid-palate, but then the milky sweetness of the chocolate comes through very nicely in the end. Both were successful. 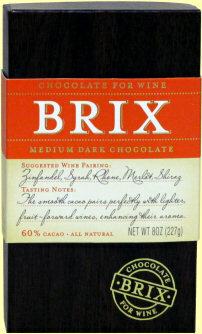 Congratulations to Dr Proia and to the manufacturers of Brix: this very high quality chocolate does indeed have unexpectedly successful wine-matching characteristics, even with grape varieties and wine styles that would normally be no-go areas for chocolate; with some of the wines the effect of nibbling a shard of Brix was as wine-friendly as doing so with a chunk of Parmesan. What fun to spring some of these combinations on wine-loving friends. Brix is available in the UK from The Wine Gift Centre (a sponsor of wine-pages). I note that at time of writing the Trio Gift Set with Cherry Wood Chopping Board and Chocolate Knife is currently on special offer down from £37.99 to £27.00.